Gorata (Rati) was born on March 17th 2002 in Botswana, southern Africa. Gorata means “to love” in Setswana, the national language. Rati’s parents first suspected something was wrong when she was five months old. Her eye began to turn and glow white occasionally. A doctor at the local hospital queried retinoblastoma, but concluded Rati was too young to develop cancer. Her family was not made aware of this, and she was sent home. Rati’s eye did not improve. The squint became slowly more noticeable, and the strange white reflection grew brighter and appeared more frequently. Remaining uneasy, her family began saving money for a second opinion across the border in South Africa. Four months later, doctors in Johannesburg diagnosed unilateral retinoblastoma. They recommended urgent removal of Rati’s left eye, followed by chemotherapy. Rati’s eye was removed in Botswana two months later. Pathology examination of the eye was done, showing cancer cells in the outer layers – a high risk feature for relapse. Doctors believed the surgery alone had cured her, and no chemotherapy was prescribed, though it was available. She did not receive an implant or artificial eye and was discharged after just two follow up visits. 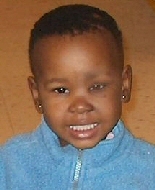 19 months later, in September 2004, Rati’s parents began to notice a swelling in her eye socket. She was quickly diagnosed with a recurrence of the cancer, but Botswana has limited resources to treat retinoblastoma outsite the eye. Doctors offered no hope of cure. On September 29th 2004, Rati’s mother, Salome, contacted a retinoblastoma support website, requesting information, advice and prayer. In Oxford, England, Rb survivor Abby White read the email and immediately began using her contacts to find help. Dr Brenda Gallie offered hope at Toronto’s SickKids Hospital. English schoolgirl, Daisy, had recently returned from retinoblastoma treatment there. Her family pledged money from The Daisy Fund for travel and initial treatment costs, and Rati flew into Toronto with her mother and Abby on October 25th, 2004. Tests showed the cancer had spread into Rati’s brain and cerebrospinal fluid (CSF – fluid bathing the brain). However, her doctors felt there was a chance of saving her life, and she deserved that opportunity. Rati received chemotherapy every three weeks for five months. Chemotherapy was also delivered directly into her CSF every week. She cooperated very well. With the help of a wonderful child life specialist – Morgan – she even completed 25 days of radiotherapy with no sedation, at just two and a half years old! In January 2005, molecular analysis compared CSF samples against a sample of Rati’s tumour. These tests and MRI found no trace of cancer. In April 2005, Rati had a stem cell transplant. Stem cells were removed from her blood, through a process similar to dialysis, and stored while she received very high doses of chemotherapy. These drugs would hopefully destroy any undetected cancer cells, but they would also destroy Rati’s bone marrow (the “blood cell factory”). Following three days of super-high-dose chemotherapy, the stem cells were returned to her to “rescue” her bone marrow. In time for her third birthday and the transplant, South African Airways donated flights for Rati’s father and three sisters, reuniting the family in Canada. Angel Flight North East transferred the family from New York to Toronto, and they remained together at the Ronald McDonald House after five months apart. Weekly intrathecal chemotherapy would continue for a year after transplant, but in January 2006, Rati suffered a seizure. A CT scan revealed the cancer had come back throughout the lining of her brain. No further treatment was possible to save Rati’s life. She and her family continued to receive support from the Rb and palliative care teams and Daisy’s Eye Cancer Fund, cherishing their time together. Rati celebrated her fourth birthday with a big dinner at Toronto’s Ethiopian House restaurant. Dr Brenda Galle presented her with a certificate, recognizing her as the first World Retinoblastoma Citizen. Rati died on August 21, 2006. Her life inspires a hope that one day no child will face death, as she did, because they did not receive timely, appropriate care.